The Backwoods Engineer: Continued Complaints against the AL RKBA Amendment: "Inalienable" v "Fundamental"
Continued Complaints against the AL RKBA Amendment: "Inalienable" v "Fundamental"
I can't believe it, but the Bama Carry organization is still caterwauling on their Facebook page about the passage (72%) of Amendment 3, as they have done since it first was voted by the Legislature to appear on the ballot. Every citizen has a fundamental right to bear arms in defense of himself or herself and the state. Any restriction on this right shall be subject to strict scrutiny. If you can believe it, the objection now is the wording "fundamental right", which these rubes believe to be somehow less than rights described by the phrase "inalienable right". There ain't a substantial difference, people. The two terms are used interchangeably. Don't believe it? Look, Ol' Backwoods ain't a lawyer, but I can read and reason. And I trust those attorneys, judges, and justices who have argued and written our pro-RKBA case law. After declaring their independence, the newly formed States replaced their colonial charters with constitutions and state bills of rights, almost all of which guaranteed the same fundamental rights that the former colonists previously had claimed by virtue of their English heritage. See, e.g., Pa. Declaration of Rights (1776)... declaring that "all men are born equally free and independent, and have certain natural, inherent and inalienable rights," including the “right to worship Almighty God according to the dictates of their own consciences” and the "right to bear arms for the defense of themselves and the state." Several years later, the Founders amended the Constitution to expressly protect many of the same fundamental rights against interference by the Federal Government. protected traveling citizens against state discrimination with respect to the fundamental rights of state citizenship. 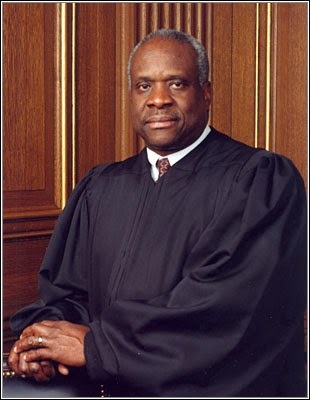 I guess Justice Thomas is a backwoods rube who doesn't know his fundamental from his inalienable, huh? I have seen this sort of things in other places as well. Words are important, but as we see people do things that are nearly incomprehesible to honorable men, people seek some magic phrase or word that will make things right. It is sort of like the "sovreiign individual" idea that people get tripped up on. Do they really think that a conspiracy to take over the world is going to worry about the symbolism of a gold fringe on a flag? The law does not constrain the lawless. This applies to politicians and Judges as well as others.